We are super excited about this theme! When Jesus says, “Follow Me” to our participants, we want them to respond with, “I am All In!” And like always, the Mission Adventures Design Gnomes™ at the Secret Northwestern Production Facility™ have been working quadruple over time to bring our theme to life. We’ve got some truly incredible Mission Adventures Gear to show you—we honestly think it’s the best yet, and we know you and your teams are gonnu love this stuff! Click the Download Order Form button to get the mathematically tuned Micro$soft Excel spreadsheet file. We’ll deliver your MA Gear by the first week of March. As you can see in the slideshow at the top of the page, we’ve got two amazing tee shirt designs for All In. We will print the guys design on a super-duper unisex shirt that’s lightweight, soft, and has a slightly fitted cut. We will print the girls design on a really cute ladies cut tee that is a little bit longer, has shorter sleeves, a thinner collar, and a tapered, fitted cut. If you’re at all concerned about the fit of the girls tee, order a size up. If that stresses you out, we’ll be happy to print the girls design on the unisex cut tees for you. All you have to do is write (or type, if you’re submitting your order form via email) “UNISEX” really big next to the girls bundles you order. Questions? Just call the telephone number on the order form, and I’ll help you out! Wow. Just wow. Where to start?! Okay, the garment—these are high quality 4.5 ounce (not too heavy) 100% ring spun cotton (super-soft) dyed charcoal gray. The stitching details, the crew neck, and the fit of these shirts all say, quality. The unisex cut is generous, but not boxy. The women’s version is fitted* with shorter sleeves and are just a bit longer. Your kids are gonnu love these tees. Don’t get me started on the art—I mean you can see it for yourself. We’ve got not one, but two incredible designs. Both are beautifully printed with a soft hand, (meaning you can barely feel the ink on the tee) with a subtle gradient and a slightly distressed texture. You will be proud to give these tees to your teams! *NOTE: The women’s version is a fitted garment. That means it’s tapered—not aggressively so, but still… So if you’re at all concerned about how a fitted tee will look on your teens, order a size up. Don’t want to risk it? No problem, we’ll print the girls design on the unisex tees for you. Just write “UNISEX” real big next to the girls bundles on your order form. Every feature of this journal is designed to help your students make it their own. And we know if they make it theirs, they’ll take it home where it will continue to inspire them. This edition has 124 pages filled with calendars, notes pages, graph paper, and even a couple of pages where they can play that connect-the-dots box game. Of course, the Journal is all about devotions—this year we’re challenging the teams to read Proverbs.You’re gonnu flip when you see how the kids will actually create their own devotions for all 31 chapters. Yes, there are lots of articles including a super practical testimony workshop that will prep your teams for evangelism. This is a hexagonal #2 pencil. It’s black. Everything about it is black—the lead, the barrel, the ferrule (that metal thingie between pencil and the eraser), even the eraser is black. I didn’t think they could do that, but they can, and they did. The MA Blackout Pencil is included in every bundle. And you can get extras for just a quarter. This beauty is made of a 12 ounce natural cotton canvas that’s both durable and gorgeous in its undyed natural-ness. It’s nice and roomy, with a drawstring top and a web shoulder strap. We think your teams are going to fall in love with this bag and use it when they get home. Oh, and did we mention it’s got the sweet All In artwork printed in olive? Yeah, it does. Boom. You know, the Commitment Booklet and Commitment Card have been around a long time. Just the other day a long-term full-time missionary told me that she still has her Commitment Card from eight years ago. It’s crazy that these things have inspired so many people to go so many places. This year, we gave the Booklet a total overhaul. It’s new in every way—new format. It’s more easily pocketable. And somehow, even though it’s physically smaller, there’s more room inside. (This kinda sounds like a commercial for a Honda Civic… ;)) The Commitment Card is now integrated on the inside back cover. We’ve included some inspiring photography, and we know your teams are gonnu be inspired. The beautiful All In lock up is printed on some ultra thick card stock for durability. Not only that, we printed it on both sides, ‘cuz you know, those things are prone to flipping around when you’re wearing ‘em. We’re even throwing in a quality woven lanyard with a durable metal clip. Oh, and please use name tags, it’s Biblical. These Name Tags are included in both the Big Bundle and The Works!™ or available separately for $3. This is a super-premium, heavy duty, ruggedly attractive messenger bag. It’s canvas. It’s denim blue, and it’s washed with enzymes. It has tons of pockets and zippers. The flap even closes with magnets. The shoulder strap is adjustable and is attached to the bag with some beefy metal D-rings. Everything about this bag says, “I am All In” and we are proud to offer it for your teams. It’s included in The Works!™ bundle, or separately for $25. It’s easily worth $40 on the open market—your teams are gonnu love this bag. Period. This is the real deal—accept no substitutes. It’s fine tipped, and customized. What more could you ask for? It’s included with The Works!™ bundle, or separately for just $2.50. This is a high-quality sticker, folks. Not only does it feature that sweet All In lockup, but it’s printed with an über-cool matte finish on heavy duty vinyl with a thick paper backing. It’s slathered in a magical Gnomish UV coating so it won’t fade in sunlight, and your kids are gonnu think it’s soooo awesome! It comes in The Works!™ bundle, or separately for just 75¢. They call ‘em badges in England, but on this side of the pond, they’re buttons. This premium button features that sweet All In lettering, that will inspire your teams. This bad boy comes in The Works!™ bundle, or individually for just 75¢… That’s so cheap you could get one for everybody! This 28 ounce water bottle is made out of aluminum. It features a flip-top spill proof lid and is covered in some of the coolest art this side of Narnia. 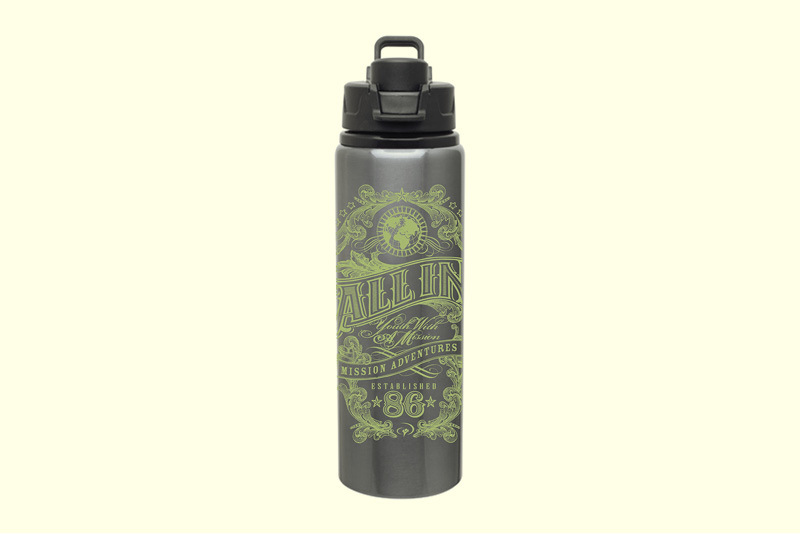 The water bottle is not included in any of the bundles, but at only $9 USD, it’s a tremendous bargain. Get one for each of your staff and get a couple dozen to sell to your teams!